Growing up, the only way I knew how to cook steak was on the grill. And I gotta admit that bringing flame to meat was, and still is, a satisfyingly primal expression of the culinary arts. However, over the years, I've found that great steaks can indeed be cooked on the grill, and so each time it's time to cook a steak, I gotta make the grill or not to grill call. Most importantly, when the choice to grill is made, you need to make sure you use the techniques that will give you the perfect grilled steak. Not shockingly, they are much the same as cooking a steak indoors, you just have apply the rules slightly different. About 20 – 30 minutes prior to cooking, you want to take the steak out of the fridge and allow it to come up to room temperature. Room temp steaks are easy to cook to the desired temperature. If you start cold, it's harder to get the center to med-rare, or medium without the outside getting over cooked. Additionally, a cold steak will cool down the pan when you put it, which makes it harder to get a good sear. Once the steak is at room temp, and right before cooking, you want to season the steak liberally with Salt and Pepper. Both help the crust form on the outside of the steak, and give the meat a great flavor. It's also the time you'd want to put on any additional spice rubs. Right before putting the steak on the grilled, you'll want to coat the steak in oil (I like olive oil). One of my favorite aspects of steaks, is that you can get a crusty, highly flavored seared exterior, that contrasts with a tender, juicy, (for me med-rare) center. The combo provides a range of flavor and texture that makes a perfectly grilled steak so wonderful. They best way to achieve that contrast, is by making sure your grill is very hot when you start cooking. I like to preheat my grill (either coals, or gas) for 15 – 20 minutes prior to cooking. A good test is you should not be able to hold your hand about 6 inches above the grill for more than a couple seconds before you have to pull it away. The heat will caramelize the outside quickly, before the center overcooks, leaving it still tender and juicy. Once you lay the steak down to sear, you need (or want) to move it around or flip it too soon. 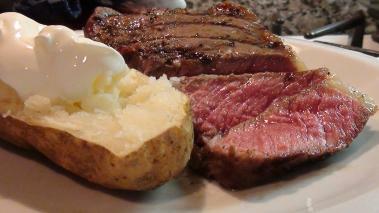 Leaving the steak alone, over high heat, will allow the steak to sear and the crust to develop. If you move it around, it will harder to get the sear, and you probably won't get very good grill marks either. After about 3 – 5 minutes it will be time to flip the steak, and you'll only need to flip it once. After about another 3 – 4 minutes, the second side will be seared. I like most cuts of steaks cooked to medium rare - that's a slightly warm, pink center. Once the second side of the steak is cooked, you can either remove the steak from the grill, if it's cooked to your liking, or if you want to cook it more, turn down the heat, or move the steak to an area with indirect heat (not directly over the coals/flame), close to lid to create an oven effect, and allow it to continue to cook. There are a couple ways to tell the internal temperature of a steak. The most reliable is a meat thermometer. This is good for the first several times you cook the steak, of if you're unsure, but the down side, is it poke a hole in the steak, which allows some of the juices to run out. Not good. With practice, you can learn to tell, using the feel technique. Essentially, if you touch the steak with your finger, the more firm it is, the more cooked it is. As you're learning to cook steak, and using a thermometer, make sure you'll feeling the meat as well, and with some practice you'll be able to differentiate different temperatures. During the cooking process some of the fat in the steak liquifies, and the natural juices start flowing more freely. If you take the steak right off the grill, and cut into it, much of those juices will run right onto the plate. However, by letting the steak rest for 5 – 6 minutes, you allow those juices to settle and re-absorb into the meat. Then if you cut into it, more steak with each bite, and you'll end up with a more tender juicy steak.